The output from a load cell is tiny! Any small interference will show up and then be amplified by the signal conditioner. The longer the cable the greater the interference will be due to increased coupling. It will be improved if screened, twisted pair cable is used as with a good quality signal conditioner this will allow a lot of noise to be removed. A certain amount of physical noise is normal, especially in very sensitive load cells. This can be from all sorts of sources ranging from computer fans on the same desk as the load cell to fork lift trucks driving around on the floor above! The more sensitive your equipment, the greater the degree of separation that is required from the rest of the world! In figure 1 below, we can see a diagram of a load cell system. For this guide I have decided to split the fault finding into the areas load cell, signal conditioner and cabling. The first thing that I’d check is the wiring connections between the load cell and the signal conditioner. The colour codes vary between manufacturer and it is best not to assume anything. Usually the colour coding is on the load cell’s calibration certificate. Ensure that the wiring is as described. Getting this wrong can give inverted or biased results. Also on the calibration cert should be the resistance between excitation +/- and also between the signal +/-. Measure those resistances with a multimeter to confirm that there is no internal damage to the sensor. (There will be a little variation from the figures stated on the calibration and this is normal). Don’t forget to disconnect the load cell from the signal conditioner before doing this. Have a good look at the load cell. Is it free to move? Any mechanical restriction will have an effect on the load cell’s output. (You can also use this phenomenon to limit the total movement of the loadcell to prevent accidental overload). Even poor cable routing can twist a small load cell and give skewed readings. Therefore it is important to make sure that the cable routing is free from any strain. Also the weighing vessel needs to be free to move in the direction of the load. Another possible problem is if the load cell has been overloaded. A small load cell could have been overloaded simply by leaning on it. If this has happened it may have permanently deformed the load cell and it will not return to its zero position correctly. This is likely to show as a non-zero reading under no load. There is a high chance that this will be terminal! 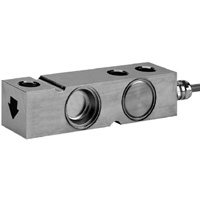 Talk to your load cell manufacturer for more information. Now we can look at the load cell cabling. As previously mentioned, the voltage outputs from the load cell are very small and easily influenced by the outside environment. There are several ways of minimising the disruption. The further apart the load cell and signal conditioner are, the more susceptible the cabling is to capacitive coupling and electromagnetic fields. Keep this cable short and there will be less interference. It is very good practice to ensure that all sensor related cables including sensor power are kept separate from any inductive loads and their power feeds. Using twisted pair cable can help reduce the magnetic influence of power cables. This needs to be in partnership with a signal conditioner’s common mode rejection capability. Screened cable prevents capacitive coupling by coupling to ground instead of the signal wires. If the screen is grounded at more than one point a ground loop is created. This is the cause of the earth hum in audio systems. This is just as problematic in instrumentation systems. Remove any extra link(s) between screen and earth. DO NOT disconnect the earth wire of the appliance in question. This is dangerous and can cause serious injury. A simple continuity test can check the integrity of the cabling. Disconnect the cable and check the resistance. In the next post we will discuss the signal conditioning part of the system….